Special Edition: The Year's Most Meaningful "Cyber Monday" Special! In honor of Cyber Monday, we're not just highlighting one strategy today. We're highlighting 52! 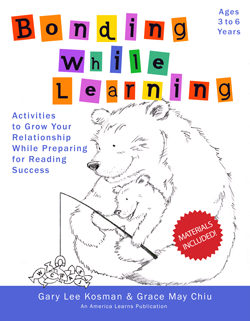 You'll find each of these strategies in our award-winning book for families, family literacy programs, and pre-schools, Bonding While Learning. While the book retails for $16.95, it's totally free to download and print through December 11th. "I believe that your book's philosophy is inspiring and great for schools as well as for individual families. Thank you for making such an outstanding book for our teachers and families." "The reading preparation activities and games help parents stimulate their children’s mental development, giving them a distinct advantage when they begin school." "That book was actually the 1st one I read to get ideas about activities to do with the kids and I found it VERY helpful as I've never had any early childhood development training or anything like that. Honestly, I plan to save it to use with my kids someday as I found the book very informative." Download and start using Bonding While Learning at http://americalearns.net/families.htm! We'll be back with our regular Network Superstar/Strategy of the Month e-mail next month. Get ready for an amazing strategy from a freshman at IUPUI who is engaging students in books they read by leading her students to create their own breakfast cereals. You won't want to miss it!